The Big Secret is out. 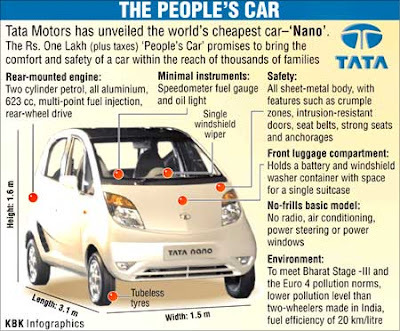 Tata unveiled the Nano, the cheapest car in the world for $2500. ( Approximately 1 lac rupees) plus taxes. Though,it is a top notch effort to produce a car at this price and hats off to the Tata company to be able to do this inspite of the increasing cost of raw materials and shrinking profit margins! The Nano is a boon for the users of millions of two wheelers who would finally be able to afford a car. Nano promises to offer very stiff competetion to the two wheeler marker in India. I presume that for the two wheeler industry to remain competetive we shall see a price drop for the two wheelers. Nano will soon be exported to other developing countries in Asia and Latin America and millions more will get the opportunity to drive a car. After the initial euphoria of Nano is over , I believe the nano will be available with many accessories and Tata will give the option to customers to buy the car from a its base of $2500 to approximately $3500 dollars. Nano marks a revolution in the small car segment and will be much spoken and researched by other Automakers and we shall see a slew of cheaper cars being launched all over the world. With millions of new cars expected to hit Indian roads in the near future,maybe the government will get its act together and speed up infrastructure development in the country. The lauch of Nano is bound to put pricing pressures on the existing small and medium car segments and we may see a slight drop in prices there. With a crumbling infrastructure,narrow roads filled with pot holes , are the road's ready to take another set of million cars on these roads? We will have to wait and see how successful Nano gets in India. To me, this is another example of our companies taking huge strides without the adequate support from the government. In cities like Mumbai and Bangalore traffic is an utter kaos with thousands of vehicles on its roads.Now with a$2500 car , we can expect millions more to be there on our roads!